Rosie's Riveters ended last week, after a run of sharing with us 28 women- real & imagined- who impacted the way we see females in stories. Rosie did an excellent job of highlighting well-written women, be they heroines or villains, and I am so glad that people participated in the series. But now it's time to move on. Instead of highlighting one particular character who stands out to you, I'm asking you to highlight one book. One book that you adore, that you prize, that changed your life, that you would save from a burning building, that you found serendipitously on a library shelf or at a used bookstore, looking lonely and ignored. A book that thrills you but that, you have come to realize, no one else has really ever heard of, much less read. 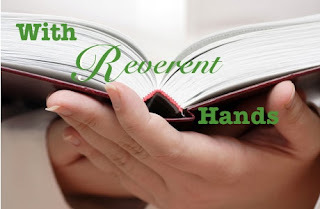 With Reverent Hands is all about those books- the ones that deserve a wider audience than they are given and that you want everyone to go out and read, even if they are out of print. So here we go- my first offering for you all, that I bring with reverent hands! And a huge thank you to Jason, who made the badge above! I had this book on my shelf for years. I don't even know how I first heard about it. I think on a Yahoo! groups somewhere. And then everywhere I searched, it got amazing reviews. So I finally took it with me on my trip to India last summer after Heather recommended it to me and it was amazing. Luckily for me, there are two sequels that I hope to get my hands on! 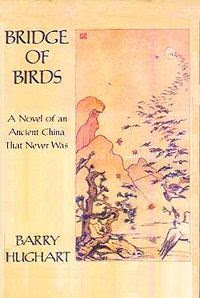 It's a fantasy novel that takes place in "an ancient China that never was." It revolves around a young man, Number Ten Ox, who must save the children in his village from a wasting disease, and so goes to the city to get help from Master Kao Li, a sage with "a slight flaw in his character." The two go off to find an antidote to the disease, traveling all over China, meeting wonderful characters, learning lessons of faith, generosity and friendship, and then return triumphantly home. It is so funny. Just a lovely light, almost ironic humor. It proves that the author really understands his world, the people in it, and their foibles. Like Blankets, he does not necessarily like the world and its inhabitants, but he never mocks them or treats them as being less than him, just because they are different. And the gentle irony is, to me, very reminiscent of Jane Austen. I love it because it manages to combine fantasy, adventure, friendship and a touching story all together in one excellent book. It is small, but it packs a punch. Also, I know so little about Ancient China, so it was wonderful to be taken there and introduced to its stories and folklore through this book. If you liked The Princess Bride, you will probably enjoy Bridge of Birds. I think anyone who enjoys Terry Pratchett would like this book because of the humor in a fantasy world. I think anyone who likes Jane Austen should read this book because of the irony employed in it. Anyone who enjoys stories about the Far East would like it. Anyone who enjoys historical fiction, particularly from several hundred years ago, not just a few hundred years. "Take a large bowl," I said. "Fill it with equal measures of fact, fantasy, history, mythology, science, superstition, logic, and lunacy. Darken the mixture with bitter tears, brighten it with howls of laughter, toss in three thousand years of civilization, bellow kan pei - which means 'dry cup' - and drink to the dregs." Procopius stared at me. "And I will be wiser?" he asked. "Better," I said. "You will be Chinese." What a great start to the series. There is enough information about the book to give a real sense of it. This is one that will be going on my TBR list! Interesting! I'm not really into fantasy if I'm honest but it's great to hear of a fantasy book that's set in a country that's not Olde Worlde England. I'd love to take part - please send me a template! Oh I totally want to play, can I have a template (email at blog). I had heard of Bridge of Birds, but I'd totally forgotten about it and what it was about so thanks for the reminder and the plot synopsis. Wonderful review! I love that quote! And I always freeze up when asked questions like this ... if I think of something I'll let you know. Yay! I am so excited to see you have started this new feature! I have been waiting expectantly for it, and I would love to participate. I have the perfect book picked out and all ready to go! I love that you chose to spotlight Bridge of Birds, it truly is a wonderfully funny and engrossing read. I remember reading it awhile ago and wondering why I had never heard of it mentioned in the book world. I have my copy on the keeper shelf and have often wondered if the sequels will live up to the first book. I am going to have to find out! I hope more readers pick it up, because it really is a wonderful book that I think more people should read. Hopefully your post will turn some heads! I'm glad, Kristen! I hope you like it. bookssnob & Jodie & Kailana - Will send you the template soon! Blodeuedd- I'm excited to see yours for next week! Zibilee- I'm so glad you recommended me to take this one to india with me. It is staying on my keeper shelf, too. If we both decide to invest in the sequels, though would be fun joint reads! What a great entry to what I am sure will be a memorable set of posts. So looking forward to seeing what everyone has to offer in the coming months! *raising hand* i'd love to join in this, your latest creation. Oh, excellent! Whenever somebody tells me about a book that is really superb but NOBODY HAS READ IT, I have to go out and get it immediately, because I feel that way about loads of my favorites. I'm looking forward to seeing the other books in this series - and I'd love to participate if you're not already full. This idea and the spotlight feature are fantastic, Aarti! Amused- If you think of one you want to include, please feel free to let me know, too! Laura- I sent you a template. Let me know if you didn't get it. vvb32- Yay :-) I hope you read and enjoy it as I did. And glad you got the template! Jenny- I know the feeling and I'm glad I'm not the only one who has it! And definitely not full! I will send you an email soon. I love the new feature but then I knew I would! Please send me a template when you have a chance. I've read this one and you're right, it's an under-rated but wonderful story!